When it comes to your systems performance, nothing is more important than your cooling system. Historically, beefy cooling systems were more important for individuals who wanted to overclock their computers. Today, they’re useful for anyone with a modern machine. Why is that? It all has to do with turbo mode. Let’s say that you have a latest generation I-series processor that runs at 4Ghz. You’ll notice that, when under load, the CPU is actually throttled. CPUs generate heat. When they get too hot, your motherboard has to scale the performance down to keep temperatures reasonable. This means that when you’re playing a game, working with digital video, or any other demanding task, your CPU isn’t running at its peak performance. The same can be said for your video cards and hard drives. While these devices all have their own cooling system, they can only work effectively if you’re able to remove heat from your case. 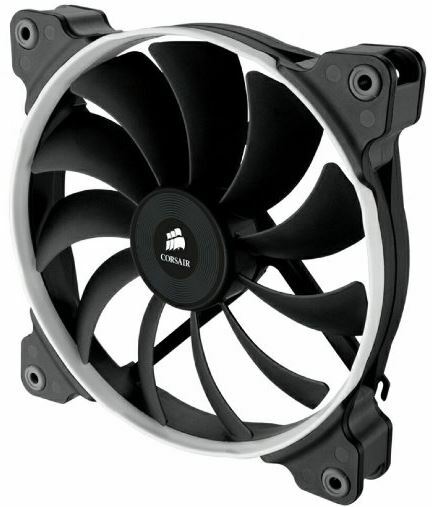 If you’re looking for the best cooling that money can buy, 140mm case fans are the way to go. Although these fans are only 20mm larger than the next size down, they push significantly more air at a lower volume. If you’ve purchased a high-end computer case, you’ve likely got space for at least one of these fans. When we build our own computers, we always make sure that there is at least one of these fans installed. With so many options to choose from, it can be hard to know which one suits your computer case. We’ll be taking a look at the three best fans on the market. First, we’ll show you the differences between them. Then, we’ll help you find the one that’s right for you. Whether you’re talking cases, cooling, or performance, Corsair is one of the first brands that comes to mind. They’re known for their high-end computer cases, but without these fans their cases wouldn’t perform as well as they do. Whether you’re looking to get the most out of your existing Corsair case, or beef up the cooling in another model, this is a great place to start. The Corsair Air Series AF140 Quiet Edition is built to a much higher standard than your average model. Everything from the bearings to the mounts are high quality. The first thing you’ll notice is the shape of the enclosure. Instead of the standard square case with a round cutout, the circular housing gives it a professional appearance. The four mounting holes are tacked onto each side, looking a bit like legs. Whenever moving parts are involved, it’s important to prevent vibrations. For this reason, fans need to be torqued down pretty hard into the mounting holes. What Corsair has done is line the mounting points with small rubber o-rings. These rings allow a little extra pressure at the mounting points, keeping things stable and secure. Fans are generally located at the front, or on the top of your case. They occupy quite a bit of space, but are generally designed to blend into the background. 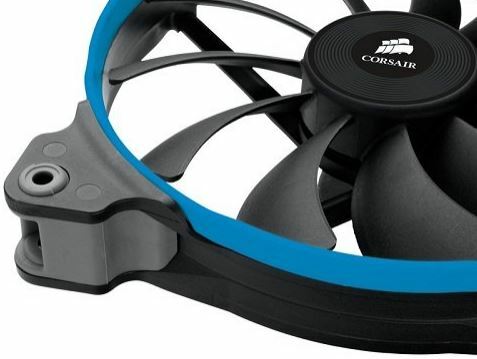 Corsair wanted to make something that could help your desktop stand out, so they added a stylish color band that attaches to the face of the fan. You’re given a red, blue, and white model, which allows you to add a highlight of color that matches the rest of your case. With speeds of up to 1150 RPM, this fan means business. One of the things that we looked for in all of our high end 140mm fans was high airflow, and at high RPMs this fan doesn’t disappoint. Airflow is measured in CFM. This stands for Cubic Feet per Minute. With a maximum airflow of 68.7 CFM, this fan can evacuate all of the air in your case in a matter of seconds. It’s important that we note that these fans are only one component in a proper cooling system. You’ll need fans that help to pull air in, and fans that help to push it out. But a pair of these should be more than enough for any computer system. Although this is a large fan with a number of high speed blades, the noise level is still much lower than we’re used to seeing. A major factor in this is the way that the fan is designed. Smoothly rounded blades and a gradually tapered housing reduces hard shifts in air direction, keeping the fan silent. We will note that the noise is noticeable when the fan is operating at high speeds. The loudest sound level we were able to measure was 24 DBA. For reference, 10 DBA is considered to be “barely audible.” The sound of breathing is around 10 DBA. This fan is closer to the sound of a whisper, or the sound of leaves rustling. If you want a dead silent computer, you can throw in the voltage limiter. This is a resistor that is included with the fan. It plugs into the 7 volt power outlet included on most power supplies, then into the fan. By dropping the voltage, you reduce the airflow by roughly 25%. But you cut the sound level down below 10 DBA, where it is not audible. It’s common practice for anyone who wants a silent PC to use multiple fans at low speed in place of a single fan running at full speed. 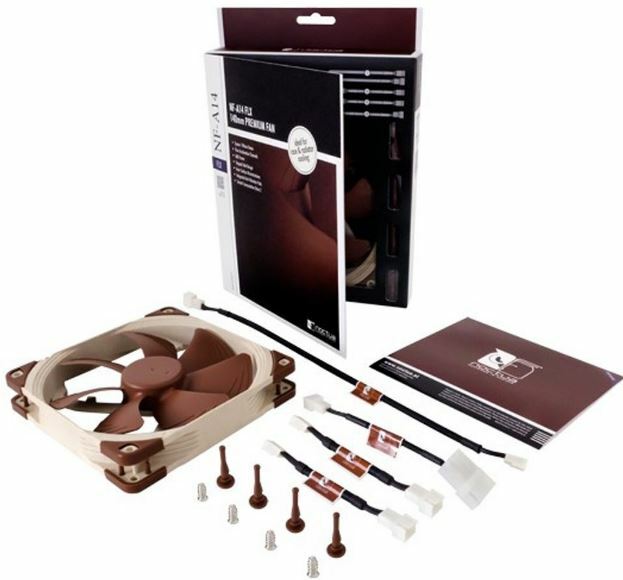 Noctua is a brand that isn’t just associated with impressive thermal performance, but also with ultra-low noise levels. Their products sell for a premium, but they’ve shown time and time again to outpace the competition. Their 140mm Premium Fan is the top of the line, so let’s see how it performs. 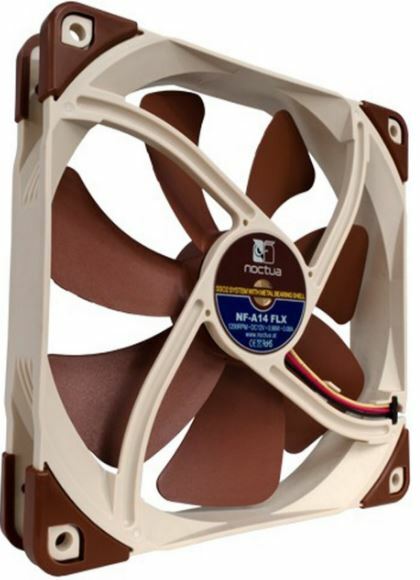 If you’re familiar with Noctua’s products, you’ll recognize their tan and brown color scheme. The blades themselves are a slightly darker color from the enclosure, which adds a bit of contrast to the whole system. This exact color scheme is used in all of their high-end CPU coolers, so it will match if you use one of them. Where durability is concerned, you’re definitely getting what you pay for. The entire fan is incredibly rigid, much more so than cheaper fans. We’re happy to see that the rubber pads have been put in all four corners. Although they’re not quick as squishy as the o-ring style, they’re a little more flexible in terms of where they can be installed. Even if your fan grate isn’t completely flat, they still protect the fan against vibration and noise. This fan can be torqued down a little harder than some, thanks to its full size frame. With that in mind, it’s ideal for anyone who wants to build a custom computer that requires a little extra strength. This fan is ideal for anyone who wants the maximum output possible, without any sacrifices. It’s designed to run at a single speed, and doesn’t automatically adjust as needed. At stock 12V speed, it’s rotating at 1200 RPM, which is pretty standard for a fan of this size. It pushes air at 68 CFM, which should be enough for even the most extreme situations. Personally, we find that this volume of airflow is almost excessive for your everyday computer. Unless you’re running a very aggressive overclock, we’d recommend using one of the included adapters. This cuts the airflow by 1/3 or 2/3 depending on which one you install, keeping the fan a little quieter. That being said, two of these fans each running at a third of their capacity in a push / pull arrangement will move the same amount of air as a single fan running at full speed. There are a few features on this fan that help keep it nice and quiet. The most important is the precisely engineered bearing. There is very little play or movement. You can feel this when you hold the fan in your hand. The blades don’t wiggle around or move, they just stay solidly in place. When rotating, there is no annoying vibration or rattling to hear from. The other features are a little more subtle. The tapered grooves around the air inlet helps to reduce drag, and the grooves in the impeller does the same. Overall, at the highest level of noise you’ll near is 22 DBA. When you use the adapters to slow it down, the fan is silent. Corsair’s ML series fans might look a little beefier than you’re used to seeing, but it’s not just a visual treat. This fan has cutting edge technology that put it ahead of the pack. 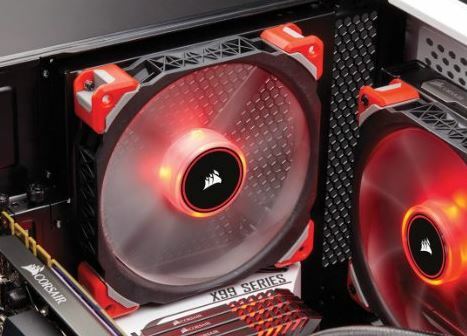 If there is one word we’d use to describe the Corsair ML140 Pro LED Fan, it’s “hefty.” This fan features a thick inlet that runs around the impellers, with four large supports holding the motor in place. The case mounts are covered with a large rubber cover, similar to the one used in the Noctua fan. When turned off, there isn’t a lot that stands out from the fan aside from the red highlights on the mounts. But when you turn it on, a bright LED illuminates the blades. There are several different colors to choose from. Our personal favorite is the red model, although blue and white are available if you prefer them. What makes this fan unique is its magnetic bearing. The fan blade itself actually floats above the motor thanks to magnetic levitation. It’s able to spin without making any physical contact with the motor itself. This allows the fan to move at a higher rate than most. With a top speed of 1600 RPM, it can push a maximum of 97 CFM of air. This is significantly higher than any other fan on the market, but that’s not all it has to offer. Because of the unique way this motor works, the fan can be driven at very precise speeds. This gives you high airflow when you need it, or low airflow when you want to keep things quiet. When running at top speed, this fan makes a little more noise than the competition. It produces a maximum volume of 37 DBA, which makes sense as it’s pushing significantly more air than competing fans. 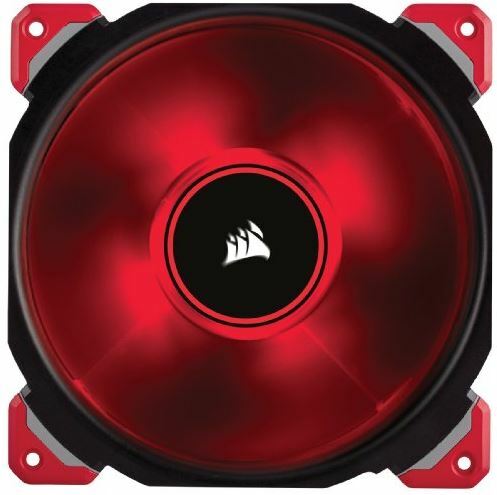 When the fan is stepped down, the noise drops drastically. At 400 RPM, the fan is still pushing 12 CFM but only produces 16 DBA, which is virtually silent. 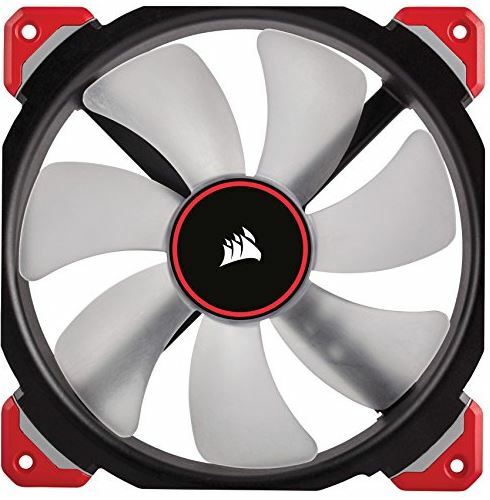 Which 140mm Case Fan is Right for Me? If you’re not sure what to choose, you first need to think about your needs. Which one works for you depends on how hot your hardware gets, how many fans you plan to buy, and the cooling performance of your case. 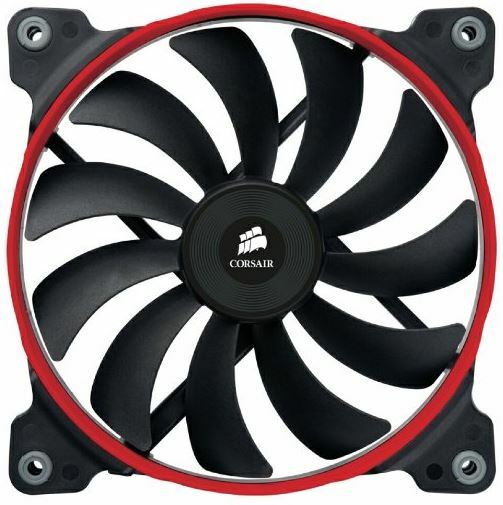 If you want a quiet fan that can run at a variety of speeds, check out the Corsair Air Series AF140 Quiet Edition. This fan is affordable, fast, and still surprisingly quiet. 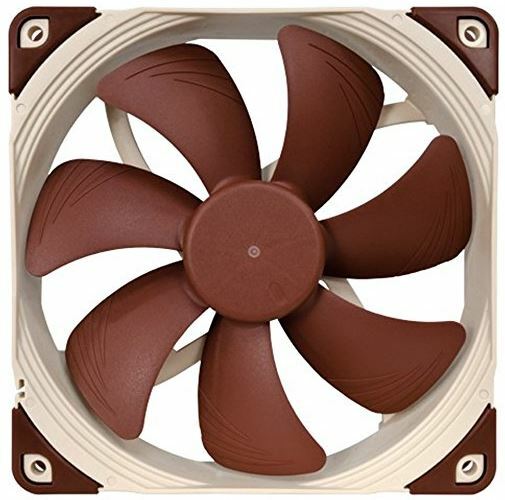 If you’re looking for cooling performance over silence, the Noctua 140mm Premium Quiet Quality Case Cooling Fan takes the cake. It works well on its own, or can be paired up with multiple matched fans to provide excellent cooling with reduced noise. If you want the best of the best, the Corsair ML140 Pro LED is for you. This fan has the best airflow out of any that we’ve tried, making it the best on our list. Need a smaller fan that can still move a ton of air? If your build can handle it, we highly recommend taking a look at some of the best 120mm case fans as well.